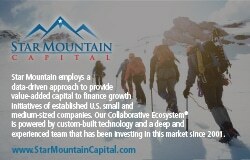 Star Mountain’s Founder & CEO Brett Hickey is speaking at Market Group’s Private Equity US Forum on Monday, May 6th in New York, NY. His panel will discuss the middle market and growth investing. To register or see the full agenda: Click Here.